SCP-2137, out of its casing. Special Containment Procedures: When not being used, SCP-2137 is to be kept within a typical electronic 10-digit metal safe in the Safe Wing of Site 23. All digital and wireless broadcast media must be kept at least one hundred meters away from SCP-2137. Due to SCP-2137's anomalous effect having been determined to have no ranged limit, digital, wireless and broadcast media may be used but should be monitored closely for any appearance of SCP-2137-1 or -2. Other than the testing and recording of Track 7, SCP-2137 should be considered an inanimate item without agency of its own, and any demands or threats made by SCP-2137-2 should be ignored. Once a week, 2137 is to be cleaned and all tracks are to be played in succession, with special attention paid to the instance of 2137-1 that replaces track 7. The names, situations and anecdotes presented in that instance of SCP-2137-1 must then be reported to 2137 Special Committee ("Pac Watch"). On the rare occasion that non-Foundation organizations cannot address the situation presented in an instance of SCP-2137-1, O5-9 has given authorization to activate MTF-339 ("The Suge Knights") to take any and all measures necessary to reach a resolution to the problem. Operational success will be indicated by a new instance of 2137-1. Personnel who wish to examine or attempt to interact with SCP-2137 must ask Dr. Kivowitz for authorization beforehand, which will then pend O5 clearance. 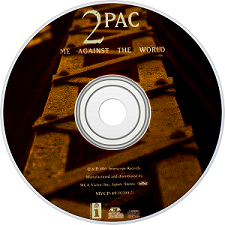 Description: SCP-2137 is a single compact disc copy of "Me Against The World," a hip-hop album by the artist Tupac Shakur, released in 1995. Physical examination as well as laser testing indicates that the CD was one of the initial release, manufactured and distributed in 1995; conventional testing of the disk itself reveals identical results to a non-anomalous copy of the album. The case and liner notes have been determined to have no anomalous qualities, and the physical makeup and encoding of the disk appear completely normal. However, upon playing track 7, normally "Heavy In The Game," the listener will encounter an instance of SCP-2137-1. The anomaly takes the form of spontaneously-generated, professionally-produced songs featuring Tupac Shakur in various styles within the hip hop genre. Though each instance of SCP-2137-1 generated is unique, they share certain commonalities in terms of subject matter. The central focus of the song invariably addresses a crime, almost always a murder or series of murders, and then gives necessary anecdotal evidence or information to correctly identify and prosecute the killer, even going so far as to specify prosecutors or recommend vigilante justice. Though generation of SCP-2137-1 has been determined to have a definite causal nature, the manner in which SCP-2137-1 instances are copied onto SCP-2137 has yet to be ascertained. The primary voice on the songs, from herein identified as SCP-2137-2, matches cleanly through advanced audio analysis to that of the real Tupac Shakur, who died in 1996, over a year before the recovery of SCP-2137. However, occasionally, on crimes of a particularly complicated or brutal nature, SCP-2137-2 will be joined by other "performers," either guest-rapping or singing the chorus or bridge. This has included many of Tupac's contemporaries, such as Snoop Doggy Dogg, Nas, No Doubt, Everclear, Weezer and Busta Rhymes, as well as artists from the 2000s including Chris Brown, Katy Perry, Lil Wayne, Lady Gaga, Rihanna, the Ying Yang Twins, Drake, Neon Trees, Jet, Jay-Z, Kanye West, and Eminem, usually at the height of their popularity. On a few notable occasions involving long-unsolved crimes by still active criminals, there have been guests of a more blatantly anachronistic nature, stand-outs among whom include Phil Harris, the Andrews Sisters, Frank Sinatra, Buddy Holly, The Who, Elvis Presley, Diana Ross, and The Beatles. Heavily anachronistic guests tend to take the role of primary artist, the song performed in their style, with SCP-2137-2 joining as a rap guest. When contacted, none of these artists had any recollection of recording for, or information regarding, SCP-2137. The crimes themselves share that they are unsolved, or, in some cases, have escaped detection entirely. The majority of instances of SCP-2137-1 address crimes of private citizens such as serial killers, spree-murders, or career criminals, though occasionally the songs will address larger groups, such as Hamas, ISIS, the IRA, and even in two separate instances the Chaos Insurgency and the Church of the Broken God. A prototypical example of SCP-2137-1 is included here for reference. When the crimes have been addressed and the guilty parties brought to light, either by the legal system or otherwise, SCP-2137-1 is immediately replaced by a new instance. However, the track is easily recorded through conventional means, recorded versions are not subject to change or replacement, and the original can be replayed from the CD endlessly before the killer is found, with no little variation. There are currently nearly one thousand instances of SCP-2137-2 on record. SCP-2137 was recovered in the home of Avon Lincoln, arrested for the vigilante slaying of Michael Ferris, who was later revealed to have been the Ojai Strangler, responsible for six murders over the summer of 1996. Avon's insistence that Tupac Shakur spoke to him from beyond the grave and told him he had to take justice into his own hands, because Ferris' position as District Attorney would prevent a fair trial, drew the attention of Foundation agents after the song in question was produced as evidence in court. Amnestics were administered to all involved, and Lincoln was released back into the general population. Initially, researchers experimented with anonymously tipping off local police departments through Foundation plants, which led to the resolution of over ███ cold cases, including the recovery of SCP-██, SCP-████, and SCP-617, though no direct link has been established other than the murders involved. However, after █ years this use of the SCP was deemed impractical; repeatedly addressing the crimes discussed in 2137's "music" was, in practice, allowing the SCP to dictate the circumstances of its containment, and under the wrong circumstances, opened the Foundation to potential exposure through continuous interaction with law enforcement at all levels across multiple governments. In response to this, O5-9 ceased addressing the crimes in late 20██. After two months passed, SCP-2137's behavior radically changed, when, for the first time, an instance of SCP-2137-1 was produced that revealed SCP-2137-2 had an awareness of its containment. The decision was made to halt testing entirely, rather than acquiesce. After one week passed, an instance of SCP-2137-1 appeared spontaneously on the YouTube channel of Los Angeles-based hip hop station [DATA EXPUNGED], and in the lone hour before it was taken down accrued over █████ views. The image displayed on the video was a still photograph, apparently authentic though by its nature highly anomalous. The photograph is of Shakur, estimated to be in his early forties,1 wearing the garb of Foundation D-Class Personnel, with his middle fingers raised. The accompanying song, titled "███ █████," focused on SCP-███, revealing its actual location and means by which it could be broken free of current containment procedures, and identified several members of the O5 Council by their first names as it described the function and nature of the Foundation. In a massive sweeping operation involving the activation of multiple task forces across █ continents all trace of the video was erased, and all █████ viewers were administered Class-A Amnestics. Midway through this operation, an entire album titled "XK Scenario" was released to the iTunes account of Beyonce Knowles. Each song featured SCP-2137-2, as well as a variety of guest artists, and focused on a different Keter class SCP currently in captivity. Though SCP tracking bots were able to bring "XK Scenario" down after only ███ downloads, complete digital eradication of the individual files has proven difficult. Though no loss of life or property was incurred, the sheer scale of the danger posed by this containment breach prompted a Foundation-wide state of high alert. This prompted an ongoing upgrade to all automatic SCP firewalls, and engendered the reclassification of SCP-2137 from Euclid to Keter. The breach sparked heated debate as to how to proceed with the containment of (and conceptual understanding regarding) SCP-2137, which came to an end upon the appearance of a new instance of SCP-2137-1. This instance was produced spontaneously through the mouth of SCP-███, which appeared to fall into a trance state during the incident, with the lyrics, in totality, repeatedly written in what was identified as [DATA EXPUNGED] one hundred and seventeen thousand (117,000) times all over the interior of its containment chamber. What if I told you I ████ ████ ███ █ ███ it all? What if everyone knew that ███ ████ █ ███ bout to fall? Think my rhymes are a problem? The decision was made to resume the former method of testing, involving the embedded informants used to relay SCP-2137's evidence and information, while continuing to study the method by which SCP-2137 transmits its broadcasts, in an effort to truly contain it completely. SCP-2137-2 resumed its previous behavioral pattern, SCP-2137-1s focusing on crimes until their killers are located by conventional law enforcement, with the exception of one final track — at this time, its last recorded direct interaction with the Foundation. Investigation into any kind of link or pattern between the crimes SCP-2137 solves is ongoing, as is interest to why it doesn't use its agency to pursue the criminals in question rather than working through proxies. 1. At the time of his murder in 1996, Shakur was twenty-five years old.